delta to the core, and exit the pattern on the same side as it entered. *A loop pattern has only one delta. 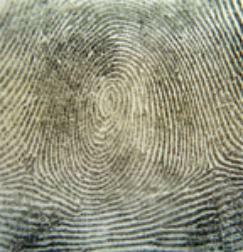 A whorl pattern consists of a series of almost concentric circles. opposite side. There are no deltas in an arch pattern. itself, will remain permanent for the life of the individual until the body decomposes after death. 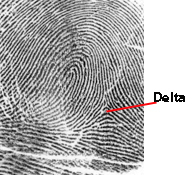 Fingerprint Identification has been used as a means of positive identification for over one hundred years. 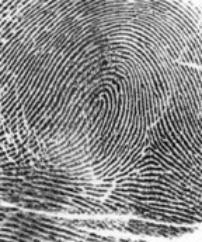 fingerprint is unique and can only belong to one person. This theory is tested everyday, and has never been disproved. the same relative area and position, and if their unit relationship to each other is in agreement. The two innermost ridges which start parallel, diverge, and surround or tend to surround the pattern area. When there is a definite break in a type line, the ridge immediately outside of it is considered as its continuation. divergence of the type lines. radiate outward in three directions.